It is extremely rare to find a friend who wants to be friends forever, but when you find them, this is the ring to buy. A Claddagh (klada) ring can be given to friends and is the world's cherished symbol of friendship, love and loyalty. The happiest day in my life is definitely the day I received a Claddagh Ring. Not only are these rings eternal symbols of friendship, it is a poetic and beautiful representation of love that is steeped in mysterious legends and lore. The ring is named after a fishing village and Malachy McCourt does a fine job of explaining all the stories surrounding this mysterious ring. This book is filled with stories of Vikings, Algerian Pirates, Legendary Fishermen, Superstitions, Traditions and stories of Mary of the Bridges. 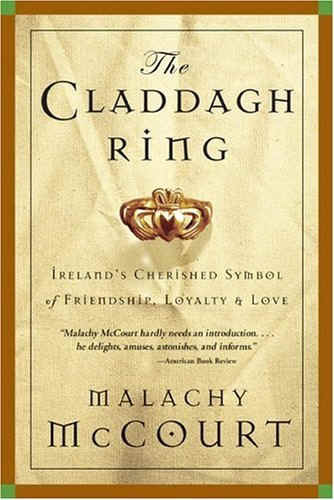 This book is really as much a history of Claddagh as it is about the ring named after the village. It also sheds light on the inventor and how he created the ring while in captivity. Malachy McCourt weaves a fascinating tapestry of stories with humor and a deep interest the history and culture of Ireland. What amazed me most was the story of 9/11 and how so many Claddagh rings were found on that day. Not only does this ring make its appearance in romantic tales, it has more recently made its appearance in great tragedy. Perhaps it is also now the symbol of the joining of hands to heal hearts.